1. Firms seldom have smooth capital expenditure streams. Firms can go through periods when capital expenditures are very high, followed by periods of relatively light capital expenditures. Consequently, when estimating the capital expenditures to use for forecasting future cash flows, we should look at capital expenditures over time and normalize them by taking an average or we should look at industry norms. 3. Finally, in estimating capital expenditures, we should not distinguish between internal investments (which are usually categorized as capital expenditures in cash flow statements) and external investments (which are acquisitions). The capital expenditures of a firm, therefore, need to include acquisitions. Since firms seldom make acquisitions every year, and each acquisition has a different price tag, the point about normalizing capital expenditures applies even more strongly to this item. 8 It is actually surprisingly difficult to obtain the capital expenditure numbers even for large, publicly traded firms in some markets outside the United States. Accounting standards, in these markets, often allow firms to lump investments together and report them in the aggregate. 9 Capitalizing R&D is a three-step process. First, you need to specify, on average, how long it takes for research to pay off (amortizable life). Second, you have to collect R&D expenses from the past for an equivalent period. Third, the past R&D expenses have to be written off (straight line) over the amortizable life. revenue increases. It is prudent, when this occurs, to set non-cash working capital needs to zero10. 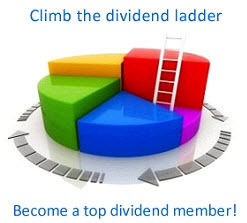 Just as in the dividend discount model, there are four basic inputs needed for this model to be usable. First, the length of the high growth period is defined. Second, the free cash flow to equity each period during the growth period is specified; this means that net capital expenditures, working capital needs and the debt financing mix are all estimated for the high growth period. 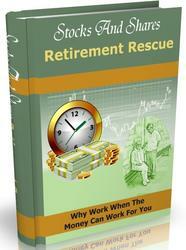 Third, the rate of return stockholders will demand for holding the stock is estimated. Finally, the terminal value of equity at the end of the high growth period is calculated, based upon the estimates of stable growth, the free cash flows to equity and required return after the high growth ends. Of the four inputs, the length of the high growth period and the rate of return required by stockholders are the same for the dividend discount and FCFE valuation models. On the other two, the differences in the other two inputs are minor but still worth emphasizing. Once the earnings are estimated, the net capital expenditures, working capital needs, and debt financing needs have to be specified in order to arrive at the FCFE. Just as the dividend payout ratio was adjusted to reflect changes in expected growth, the net capital expenditure and working capital needs should change as the growth rate changes. In particular, high growth companies will have relatively higher net capital expenditures and working capital needs. In other words, the equity reinvestment rate will generally be high in high growth and decline as the growth rate declines. A similar point can be made about leverage. High growth, high risk firms generally do not use much leverage to finance investment needs; as the growth tapers off, however, the firm will be much more willing to use debt, suggesting that debt ratios will increase as growth rates drop. There is one final point worth making about equity valuations. Since the net income includes both income from operations and income from cash and marketable securities, we have two choices when it comes to equity valuations. The first and easier, albeit less precise one, is to discount the total free cashflow to equity (including the income from cash holdings) at a cost of equity that is adjusted to reflect the cash holdings.12 The present value of equity will then incorporate the cash holdings of the company. The second and more precise way is to discount the net income, without including the interest income from cash, at a cost of equity that reflects only the operations of the firm and then to add the cash and marketable securities on to this present value at the end. This file on the web contains, by sector, the industry averages for net capital expenditures and working capital as a percent of revenues. for short periods, it is dangerous to assume that this can occur forever. 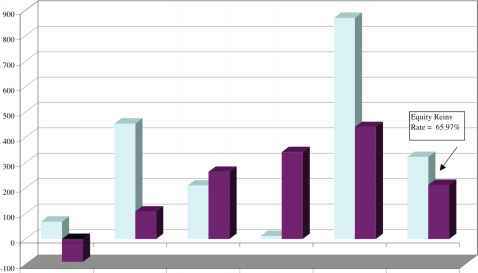 11 If the equity reinvestment rate exceeds 100%, the net income of the firm is insuffuicient to cover the equity reinvestment needs of the firm. Fresh equity will have to be issued to fund the difference. This will increase the number of shares outstanding. 12 The beta for equity will be based upon an unlevered beta, adjusted for the cash holdings of the company. In other words, if the company is 20% cash and 80% operations, the unlevered beta will be estimated attaching a 20% weight to cash and a beta of zero for cash. Normalized Equity Reinvestment Rate = Average Equity Reinvestment99-03/ Average Net Income99-03 = 213.17/323.12 = 65.97% To estimate the return on equity, we look at only the portion of the net income that comes from operations (ignoring the income from cash and marketable securities) and divide by the book value of equity net of cash and marketable securities. This non-cash ROE is a cleaner measure of the returns on equity in operating assets. Aracruz had net income of $148.09 million in 2003, interest income before taxes of $43.04 million and faced a tax rate of 34%. The book value of equity at the end of 2002 was $1760.58 million, of which cash represented $273.93 million. Non-cash ROEAracruz = (148.09 - 43.04(1-.34))/ (1760.58-273.93) = .0805 or 8.05% The expected growth in net income can be computed as the product of the non-cash ROE and the equity reinvestment rate. = 65.97% * 8.05% = 5.31% Based upon fundamentals, we would expect Aracruz's net income to grow 5.31% a year. The second term in the equation reflects the influence of debt. To the extent that a firm can earn a return on capital that exceeds the after-tax cost of debt, its return on equity will increase as it uses more debt. A firm with a return on capital of 12%, a debt to equity ratio of 0.5 and an after-tax cost of debt of 4% will have a return on equity of 16%. Lest firms view this as a free lunch, we should hasten to point out that using more debt will also increase the firm's beta and cost of equity and the value of equity may very well decrease with higher borrowing, even though the return on equity and expected growth rate may be higher.